Table 1A. Final population size with given annual growth rate and time. Be sure to enter the growth rate as a decimal (for example 6% = .06). Table 1B. Population sizes with different growth rates and time periods. The above Table 1 will calculate the population size (N) after a certain length of time (t). All you need to do is plug in the initial population number (No), the growth rate (r) and the length of time (t). The constant (e) is already entered into the equation. It stands for the base of the natural logarithms (approximately 2.71828). Growth rate (r) and time (t) must be expressed in the same unit of time, such as years, days, hours or minutes. For humans, population growth rate is based on one year. If a population of people grew from 1000 to 1040 in one year, then the percent increase or annual growth rate is 40/1000 x 100 = 4 percent. Another way to show this natural growth rate is to subtract the death rate from the birth rate during one year and convert this into a percentage. If the birth rate during one year is 52 per 1000 and the death rate is 12 per 1000, then the annual growth of this population is 52 - 12 = 40 per 1000. The natural growth rate for this population is 40/1000 x 100 = 4%. It is called natural growth rate because it is based on birth rate and death rate only, not on immigration or emigration. The growth rate for bacterial colonies is expressed in minutes, because bacteria can divide asexually and double their total number every 20 minutes. In the case of wolffia (the world's smallest flowering plant and Mr. Wolffia's favorite organism), population growth is expressed in days or hours. Each wolffia plant is shaped like a microscopic green football with a flat top. An average individual plant of the Asian species W. globosa, or the equally minute Australian species W. angusta, is small enough to pass through the eye of an ordinary sewing needle, and 5,000 plants could easily fit into thimble. There are more than 230,000 species of described flowering plants in the world, and they range in size from diminutive alpine daisies only a few inches tall to massive eucalyptus trees in Australia over 300 feet (100 m) tall. But the undisputed world's smallest flowering plants belong to the genus Wolffia, minute rootless plants that float at the surface of quiet streams and ponds. Two of the smallest species are the Asian W. globosa and the Australian W. angusta. An average individual plant is 0.6 mm long (1/42 of an inch) and 0.3 mm wide (1/85th of an inch). It weighs about 150 micrograms (1/190,000 of an ounce), or the approximate weight of 2-3 grains of table salt. One plant is 165,000 times shorter than the tallest Australian eucalyptus (Eucalyptus regnans) and seven trillion times lighter than the most massive giant sequoia (Sequoiadendron giganteum). The growth rate for Wolffia microscopica may be calculated from its doubling time of 30 hours = 1.25 days. In the above population growth equation (N = Noe rt), when rt = .695 the original starting population (No) will double. Therefore a simple equation (rt = .695) can be used to solve for r and t. The growth rate (r) can be determined by simply dividing .695 by t (r = .695 /t). Since the doubling time (t) for Wolffia microscopica is 1.25 days, the growth rate (r) is .695/1.25 x 100 = 56 percent. Try plugging in the following numbers into the above table: No = 1, r = 56 and t = 16. Note: When using a calculator, the value for r should always be expressed as a decimal rather than a percent. The total number of wolffia plants after 16 days is 7,785. This exponential growth is shown in the following graph where population size (Y-axis) is compared with time in days (X-axis). Exponential growth produces a characteristic J-shaped curve because the population keeps on doubling until it gradually curves upward into a very steep incline. If the graph were plotted logarithmically rather than exponentially, it would assume a straight line extending upward from left to right. Sixteen days of exponential growth in Wolffia microscopica. If a water molecule is represented by 100, then a wolffia plant is about 1020 power larger than the water molecule. The earth is about 1020 power larger than a wolffia plant, or 1040 power larger than the water molecule. A geometric progression is a simplified way to show exponential population growth. Starting with one couple, assume that every female has 4 children (2 boys and 2 girls). The following table compares the population growth in 7 generations. The original couple has 4 children, two of which are girls which give rise to 8 children (2 x 4). Four of the 8 children are girls which give rise to 16 children (4 x 4), etc. This is an exponential increase in which the population doubles each generation. The 7th generation has a population of 27 or 128. The English clergyman and economist Thomas R. Malthus pointed out the geometric growth of populations in 1798. In his treatise on population growth he stated that populations increase geometrically, while the world's food supply increases arithmetically. Arithmetic progressions increase by the addition of the same amount each generation, such as 2 -- 12 -- 22 -- 32 -- 42 -- 52 ... In the previous example, the number sequence increases by 10 each generation. Malthus concluded that food supply would never keep up with population growth, and the inevitable consequences of human population growth are famine, pestilence and war. Although a few biologists share Malthus' pessimistic prognosis to this day, most experts agree that human population growth is a lot more complicated than simple geometric progressions. It has been clearly documented that when a nation's standard of living and gross national product (GNP) increases, its population growth rate actually declines. In fact, some highly developed countries with very high GNPs actually have acheived zero population growth. This is also related to economic and cultural pressures. One of the best examples of a small country with a high GNP and a low population growth rate is Japan. The population growth rate for the United States is currently less than one percent (as of 2000). Some countries, such as China, offer strong economic incentives to have only one child per family. There are additional arguments against Malthus' dismal prognosis. With modern methods of agriculture (The Green Revolution) some highly developed countries have increased their food supply geometrically; however, with the limited amount of arable land and urbanization pressure, this level of productivity may not continue indefinitely. As of the year 2000, there is sufficient excess food to feed the entire world. The problem is distribution of the food to starving people in remote regions of the world, not the supply. Whether there will be an excess food supply in another century remains to be seen. Perhaps Malthus may be correct in the final analysis. Applying a geometric progression to fruit flies (Drosophila melanogaster) results in astronomical numbers in a relatively short period of time. Starting with 2 fruit flies, assume that each female lays 100 eggs every two weeks (25 generations per year). How many flies will the 25th generation have at the end of a year? To appreciate the number of flies in the 25th generation, assume that the flies are packed together 1000 to a cubic inch. This number of flies would fill a ball 96 million miles in diameter, greater than the distance between the earth and the sun! Of course this is only theoretical. The natural control forces of nature will prevent this staggering fruit fly explosion from ever happening. In fact, there is a rule of nature that states "survival rate is inversely proportional to fecundity." In other words, animals with a high production of offspring (high fecundity) have a low survival rate among their offspring. In worms, insects and fish that lay thousands of eggs, only a few of their eggs will ever reach maturity. With a 20 year generation interval, the total number of people at the end of 60 years is 80 (2 + 6 + 18 + 54). With a 30 year generation interval, the total number of people at the end of 60 years is 26. Increasing the generation interval from 20 to 30 years reduces the population growth from 80 to 26 during a 60 year period, a percent decrease of 67.5%. A longer generation interval significantly slows the growth of a population. Exponential population growth (J-shaped curve) based on I = rN for 10 generations of Wolffia microscopica. In order to produce a J-shaped curve, the increase (I) for each generation (based on a 56 percent growth rate) is added to the successive population sizes for each generation. If these wolffia population values are plotted arithmetically for ten successive generations, you will have a J-shaped exponential growth curve like the graph shown for the population growth of wolffia using the equation N = noe rt. The difference between these two equations is that one shows the increase (I) per year with a constant growth rate (r) of 0.56, and the other shows the final population size (N) with a constant growth rate (r) of 0.56 extended over a given period of time (t). Using the equation I = rN, you must add the increases for each generation into the total population size in order to obtain a J-shaped curve. The equation for annual increase (I = rN) is modified to get the logistic growth equation described in the following paragraph. The growth of natural populations is more accurately depicted by the logistic growth equation rather than the exponential growth equation. In logistic population growth, the rapid increase in number peaks when the population reaches the carrying capacity. The equation for this type of growth contains the factor for carrying capacity (K). Carrying capacity (K) may be defined as the maximum number of a certain species population that can be supported by a given ecosystem. The annual growth of a population may be shown by the equation: I = rN (K-N / K), where I = the annual increase for the population, r = the annual growth rate, N = the population size, and K = the carrying capacity. Logistic population growth produces a characteristic S-shaped or sigmoid curve because the population increases rapidly until it reaches the carrying capacity where it begins to decelerate and stabilize. Logistic population growth in yeast cells is shown in the following graph where population size (Y-axis) is compared with time in hours (X-axis). When the yeast population growth reaches the carrying capacity (just over 500) it begins to decelerate and slow down. Eighteen hours of logistic growth in yeast cells. 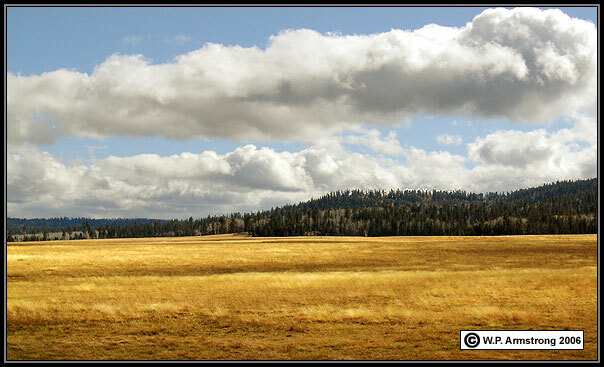 Grassland amidst forest of ponderosa pine on the Kaibab Plateau, Arizona. When the population size equals the carrying capacity (N = K) the growth rate is zero (I = 0) or zero population growth. When the population size exceeds the carrying capacity (N > K), I becomes a negative number and the population decreases. In the case of an uncontrolled deer population explosion with insufficient predators, the population declines dramatically because the overbrowsed vegetation simply cannot support the high ratio of deer. Consequently, the deer die from starvation and disease, and the population rapidly declines. This scenario actually happened in the Kaibab Plateau of northern Arizona between the years of 1907 and 1939. In 1907 the deer population was unusually low with only 4,000 head. The carrying capacity was 30,000 at this time, so a massive campaign was waged against the natural enemies of the deer. Between the years of 1907 and 1923, the natural predators of deer (mountain lions, wolves and coyotes) were eliminated by hunters in order to increase the deer population. As the following graph shows rather dramatically, the deer population increased rapidly to 100,000 by 1924, but then died off rapidly to a mere 10,000 by 1939. Because of severe overgrazing by excessive populations of deer, the carrying capacity of this region was reduced to approximately 10,000 in 1939, and the deer population was reduced accordingly. Deer Population in the Kaibab Plateau during the year 1905 - 1940. The original carrying capacity of 30,000 deer in 1907 was greatly exceed in 1924 when the deer population shot to 100,000. After 1924 the deer population rapidly declined to only 10,000 in 1939. Table 2A. Compound interest vs. exponential population growth. ** This is the same formula used in population growth. Table 2B. Money compounded daily vs. compounded continuously. Be sure to enter growth rate (r) as a whole number and not a decimal. Table 3. Determining the doubling time of a population. Table 4. Determining the growth rate of a population. Although the United States has an average family size approaching that of replacement reproduction, it does not have an annual zero population growth. This is because the birth rate exceeds the death rate per year, there is a large net immigration into the country, and the age structure contains numerous baby boomers who are now parents. Although it has be estimated that there are only about 10 billion acres of tillable land on the world's continents (only a fraction of the total area of the world's oceans), this is where most of the food for humans is derived. In terms of mass (tons), the total aquaculture harvest from the world's oceans, including seaweeds, fish and mollusks, is less than 1/600th of land agriculture. Food from the land includes grains (cereals), legumes, root crops such as potatoes and yams, vegetables, beef and poultry. But even our food from the land is not an infinite resource. Considering that 1/4th acre of land is required to provide food for one person per year, then 10 billion acres of tillable land would support 40 billion people (10 billion acres divided by 0.25 acres per person). With a world population of just over 6 billion at the onset of the 21st century (and a 2% annual growth rate), the carrying capacity for humans (40 billion) may be reached in roughly one century. The following link shows a real-time counter for the world population. Every second, five people are born and two people die. With a population increase of three people per second, at the end of a 50 minute Biology 100 lecture the world population will have increased by 9,000 people. At the end of a year, the population will have increased by almost 95 million. Starting with a population of 6 billion, this would be an annual increase of about 1.58 percent. The glass walls and roof of a greenhouse trap solar energy, thus causing the temperature inside to increase. This same phenomenon called the "greenhouse effect" is caused by gasses of carbon dioxide and methane in the earth's atmosphere. The earth's warming trend caused by the greenhouse gasses is known as "global warming." There is substantial evidence that global warming is in progress as of 2005, such as the melting of Alaskan and Canadian glaciers; however, the exact cause of global warming is a controversial subject. One of the most interesting hypotheses to explain global warming is discussed by William F. Ruddiman in the March 2005 issue of Scientific American: "How Did Humans First Alter Global Climate?" (Sci. Amer. 292 (3): 46-53). According to Dr. Ruddiman, global warming started thousands of years before we started burning fossil fuels in power plants, industrial factories and internal combustion engines. This conclusion is based on data from carbon dioxide and methane gas trapped in cores from Greenland and Antarctic ice sheets. The amount of solar radiation that reaches the earth each year is based on several complex orbital cycles, including the shape of the earth's orbit around the sun, and the wobbling or tilt of the earth on its axis. Ruddiman believes that solar radiation peaked about 11,000 years ago. The earth was on a gradual cooling trend until about 8,000 years ago, a date that coincides with the advent of human agriculture. As humans began to cut and burn forests, and to farm vast areas of land, higher levels of carbon dioxide and methane were released into the atmosphere. For example, rice paddy farming 5,000 years ago correlates nicely with an increase in methane, a product of decay bacteria in wetland areas. Cooling fluctuations during the 8,000 year warming trend can be attributed to massive deaths caused by major human diseases (plagues) where the population and emission of greenhouse gasses declined. In conclusion, the overall warming trend is correlated with human agriculture and an exponential increase in the human population. In fact, Ruddiman suggests that without the advent of agriculture, we would have entered another period of glaciation! Predictions by scientists during the 1970s that we are facing another ice age are true if you follow the cooling trend that began 11,000 years ago. Predictions of global warming by scientists during the 1980s are also true if you include the greenhouse effect. The current global warming trend may only last a few more centuries, until we exhaust the supply of fossil fuels. Hopefully we will come up with an efficient, non-polluting source of energy that is not dependent on the resources of other nations. It would be interesting to look forward into the future to see if global warming subsides when fossil fuels are no longer burned. 1. Starting with 25,000 people on January 1, a population reaches 26,000 by December 31. What is the annual percent increase? 2. Starting with 25,000 people in 1966, the population of Escondido reached 75,000 by 1984. What is the percent increase for this 18 year period? If you project this enormous increase through the year 2001, it explains the gridlock on Highway 78. 3. Kenya has an annual birth rate of 52 per 1000 and a death rate of 12 per 1000. Calculate the annual percent growth rate (r) for Kenya. 5. A local credit union pays 10 percent interest (compounded hourly) on savings accounts. When will your initial deposit of $100 double? 7. Calculate the approximate percent increase resulting from a 3% growth rate compounded daily for 100 years. 8. Calculate the approximate percent increase resulting from a 1% percent growth rate compounded daily for 100 years? 9. The world human population has a natural growth rate (r) of approximately 2 percent per year. What is the world doubling time based in this growth rate? 10. Starting with 5 billion people in 1988, calculate the world population in the year 2100. 11. Some rather pessimistic demographers speculate that the maximum number of people that can be sustained by land agriculture is about 40 billion. This means that the carrying capacity (K) for the earth is 40 billion. Starting with a population of 5 billion in 1988, when will the earth reach 40 billion (in years)? 12. Under optimal conditions, Wolffia microscopica has a doubling time by budding of 30 hours (1.25 days). Calculate the growth rate (r) of W. microscopica per day. 16. If Jack and Jill have 2 children at age 20 and their children behave similarly, at age 65 they will have a total of 8 great grandchildren, 4 grandchildren and 2 children. If they waited until age 30 to have children (and their children behaved similarly), how many total descendants would they have at age 65?